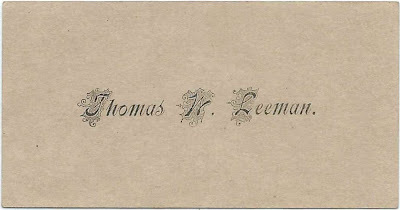 Calling card of Thomas W. Leeman. Because the card was found with a collection of Maine calling cards, many of which were from New Sharon, Maine, Thomas was likely Thomas William Leeman of New Sharon, Maine. Thomas William Leeman was born May 24, 1858 at New Sharon, Maine, the son of Alexander Leeman and Emma A. (Boynton) Leeman. On December 24, 1880 at New Sharon, Maine, Thomas married Mary Elizabeth Cookson, "Lizzie", daughter of Leander Darius Cookson and Mercy Jane (Fish) Cookson. Marie was born about November 1853 at Starks, Maine. Thomas and Lizzie farmed at New Sharon, Maine, and raised several children. The 1900 Census of New Sharon, Maine, shows Thomas working as a day laborer and Lizzie as a seamstress. They had six children in the household at the time. By 1910, Thomas was a widower; Lizzie had died earlier that year. By 1920, Thomas, still a widower, was working as a hired man. By 1930, he was boarding. Lizzie died in 1910 and Thomas in 1939; they're buried in the Locke Cemetery at Starks, Maine.